Historian and presenter Tristam Hunt, author of Building Jerusalem: The Rise and Fall of the Victorian City (Metropolitan Books, 2005), assesses the new St Pancras station, the soaring, single-span iron-and-glass train shed engineered by William Henry Barlow (1812-1902) and Rowland Mason Ordish (1824-1886), which reopened on Tuesday, 6 November, as the British terminus of the Eurostar train service. "'Railway terminuses and hotels are to the 19th century what monasteries and cathedrals were to the 13th century. They are truly the only representative buildings we have," declared the Victorian architects' journal, Building News. And none was more representative than St Pancras. Built in 1867, listed as a Grade I monument in 1967, and officially reopened today as the Eurostar terminal, it embodied all the vulgar brashness of the mid-1800s - wealth, empire, technology, and hubris -- but also the great gift of the Victorians to our cities: civic pride and a public sphere. "In the second half of the 19th century, north London was the ground zero of railway improvement. The tracks that arched into Euston, St Pancras, and King's Cross sliced through the working-class slums of Agar Town, Camden Town, and Somers Town. 'Houses were knocked down; streets broken through and stopped; deep pits and trenches dug in the ground; enormous heaps of earth and clay thrown up; buildings that were undermined and shaking, propped by great beams of wood ... ' was how Dickens described it in Dombey and Son. "St Pancras went further by unearthing the dead as well as the living. The station was named after the local parish church, whose graveyard was dug up with the forced dispersal of 8,000 souls. Overseeing the exhumations was a young architect's assistant by the name of Thomas Hardy. The daily array of coffins and cadavers that Hardy had to deal with saw him swiftly return to Dorset to recover. "The Victorians were not a sentimental people; on the remains of the dead the Midland Railway built a triumph of technology. The station's route over the Regent's Canal and its multilayered platform system were impressive enough, but the soaring, 105 ft-tall train shed was something else. Modelled on the Crystal Palace system of 'ridge-and-furrow' roofing, WH Barlow's glass and iron canopy was a model of industrial technology -- with its single-span structure and rain resistance -- and corporate bravado. Copied around the world, St Pancras became the model for New York's Grand Central station and Mumbai's Victoria terminus. "Curiously, this testimony to modern progress terminated in a building reminiscent of a 14th-century cloth hall. 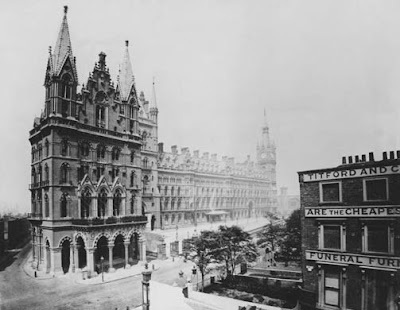 St Pancras's great frontispiece, the phantasmagorical Midland Grand Hotel, seemed to muddle the age of steam with the age of chivalry: George Gilbert Scott with Walter Scott. But it had always been the ambition of its architect to take gothic out of the church and country house and into the high street. Scott wanted to prove its modern applicability and, along Marylebone Road, he achieved that to stunning effect. The Midland Grand's steepled roofs, carved brickwork, and castellated features recall the great civic edifices of medieval Bruges and Ghent. Yet he combined this historicism with state-of-the-art infrastructure: steel girders, vast clocks, and ticking telegrams were as much part of St Pancras as ribbed vaults and oak panelling. "For St Pancras was conceived as a statement. Above and beyond the architecture of Scott and engineering of Barlow, it was a bullish celebration of the wealth, power, and industry of 'the north.' The iron came from Derby, the bricks from Leicestershire, and the money from the railway barons, industrialists, and landowners of the Midlands. The Euston arch, the Midland Grand, and the Great Northern Hotel at King's Cross were cultural testimonies to northern England's confidence. In the capital, the hard-faced men of smoke-filled towns were making their mark with the grandest architecture available. "Today, with its vast champagne bar and promise of Paris in a little over two hours, the new St Pancras might be dismissed as another component of an overheated capital. But that would be to misread the national achievement of its visionary architect, Alastair Lansley. Not only has he restored the majesty of Barlow's roof and confirmed the malleability of gothic with a 21st-century update that skilfully avoids pastiche. In true Victorian style, Lansley has also revived civic ownership of a commercial space. "Unlike Birmingham New Street or Manchester Piccadilly, this is a station of places and people. It has benches, statues, open vistas, and public toilets, while its shops and cafes conform to rather than contaminate the design. Advertising is constrained, while the glamour of train travel is revived. The Victorians worshipped profit, but also believed in a public sphere of architecture, design, and recreation. The reopened St Pancras has caught that perfectly. Lansley's next project? Rebuilding Euston arch." Shown at top: The exterior of St Pancras station in 1874. The station and hotel were declared complete three years later. Shown at bottom: The "ground zero of railway improvement" during the last half of the nineteenth century. 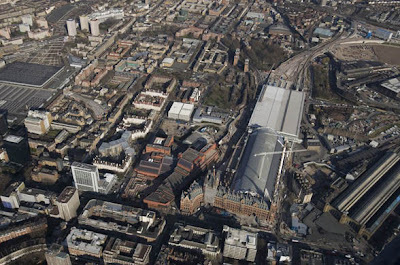 In this 2006 photo St Pancras station is shown during renovation; Euston station is at the left edge of the photo; King's Cross station is at the right edge. The reddish building to the left of St Pancras is the British Library. at I`m enjoying your blog. It`s something I discovered awhile ago and when I get a chance, I enjoy my visit.